Use on chickens 2 weeks or older. Generally speaking, immunity for Newcastle and Bronchitis only lasts 3-4 months, so revaccination is necessary to continue immunity. 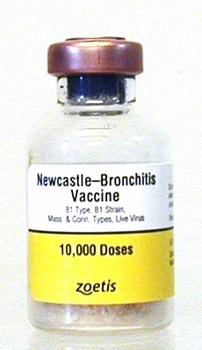 Newcastle - Bronchitis vaccine (NCL B1 BR C+M) 10,000 dose for drinking water or spray application. This vaccine does not come with a diluent, purchased as is it is for use in drinking water. Check out the #28 diluent with dropper cap if you want to try to make a vaccine for individual bird use, by the eye or nose dropper method, but as noted in the comments for the diluent, you can not use a whole bottle of vaccine for one bottle of diluent, so be careful! If you want to mix with drinking water and dose individual birds, mix this 10,000 dose vaccine with 2 gallons of non chlorinated, clean water and 1 oz. powdered milk, then give each bird 0.75 (3/4) cc down their throat with a syringe.